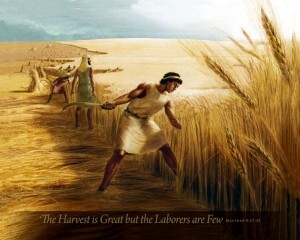 The laborers are few . . .
Matthew 9:35-38 (ESV) And Jesus went throughout all the cities and villages, teaching in their synagogues and proclaiming the gospel of the kingdom and healing every disease and every affliction. When he saw the crowds, he had compassion for them, because they were harassed and helpless, like sheep without a shepherd. Then he said to his disciples, "The harvest is plentiful, but the laborers are few;  therefore pray earnestly to the Lord of the harvest to send out laborers into his harvest." John 4:34-35 (ESV) Jesus said to them, "My food is to do the will of him who sent me and to accomplish his work. Do you not say, 'There are yet four months, then comes the harvest'? Look, I tell you, lift up your eyes, and see that the fields are white for harvest. In a recent study only 35% of Evangelical youth were committed to the exclusivity of Jesus Christ. As a percentage of those who express faith in Christ in North America, only 3-6% are under the age of 30. This is the smallest number of any time in American history. Every month 1,400 clergy leave the ministry. Every week more than 50,000 people leave the Church, never to return. Over 80% of churches in the U.S. are either stagnate or in decline. With every passing year there are approximately 3,000 fewer churches in America than the year before. In proportion to the population there are fewer than half as many churches today as there were a century ago. According to the book “Lost in America,” the U.S. is so extensively unchurched that if non-Christians in our land were to form a nation by themselves, it would become the largest mission field in the english speaking world. All of the above is happening despite the fact that U.S. churches have spent over $500 billion on itself in the past ten years, primarily to shore up the internal commitment of parish members. 1,500 pastors leave the ministry permanently each month in America. 4,000 new churches start each year in America. 7,000 churches close each year in America. 50% of pastors’ marriages end in divorce. 70% of pastors continually battle depression. 80% of pastors and 85% of their spouses feel discouraged in their roles. 95% of pastors do not regularly pray with their spouses. 50% of pastors are so discouraged they would leave the ministry if they could, but have no other way to make a living. 80% of pastors spend under 15 minutes a day in prayer. 70% of pastors only study God’s Word when preparing a message. 80% of seminary graduates who enter ministry will leave the ministry within the first five years. Only 5% of the world’s pastors have any formalized theological training at all. If every bible college and seminary operated at maximum capacity, after a three-year course of study that 5% figure would become 6%. The vastness of the urban mission field and the shortage of workers demands that we who love Christ and the city work together to leverage our efforts for maximum impact for good. In an attempt to advance the Kingdom through strategic partnerships with other like-minded organizations, TUMI strives to combine its efforts with others who are interested in providing their leaders with quality, affordable, and credible Christian leadership education.